With restaurants, the most important thing to consider is the atmosphere. Unlike other spaces, lighting in a restaurant is 100% based on what the restaurant owners/chef want their diners to experience. You can really see this highlighted when you compare different restaurants. For example, check out the installations we did at T.Pot China Bistro and Kinjo Sushi. At T.Pot, it is very important that the same colour is maintained throughout the entire space. They had had trouble in the past with differing colour temperatures messing with the ambience in the restaurant. At Kinjo, it is very important that the ‘mood’ created by the lighting matched the Kinjo brand, and that lighting scheme is consistent across multiple locations. There are two hard and fast rules for restaurant lighting though. One: No ‘blue’ lighting. This is because it is too stark, which can make you feel like you are at a dentist’s office (not exactly the feeling you want to invoke in a fine dining establishment). It also makes the food look odd, as the blue tones can make it seem like the meal is discoloured. Two: Install dimmers. This is because most restaurants like to set different moods for different seatings. For example, the lunch rush or early dinner time (when families frequent) will be more brightly lit, while the later seatings will have dimmer lighting to create a more intimate atmosphere. 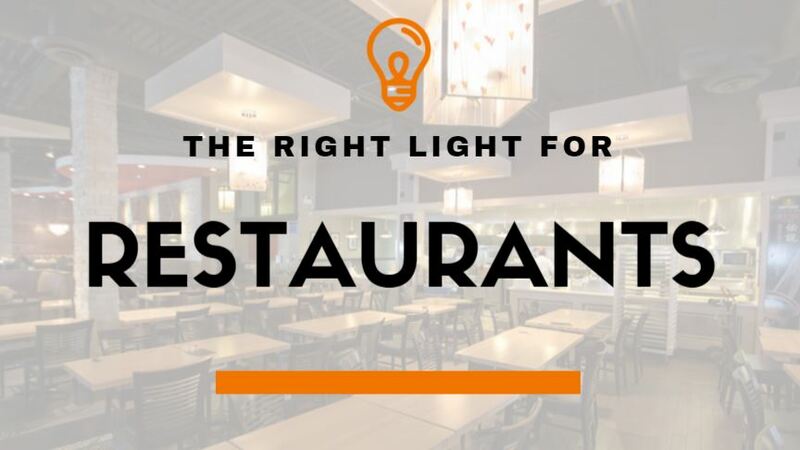 Another thing to take into consideration when designing and installing lighting in restaurants? The surfaces and the space itself. Different surfaces are reflective and may alter the look you are trying to achieve. In addition shadows, as well as soft surfaces like the carpeting and other fabric in the space, can also create some challenges that need to be worked around. Have you ever wondered which light is right for your space? We’re here to help you make the best decision for your lighting needs! Reach out to us today at info@calgarylightingproducts.com.